MANY USES Great For Camping, Emergency/Disaster Prep. & Crafts Like Bracelets, Belts, Lanyards etc. Why Buy 550lb When You Can Get The Best 750lb Paracord For Pennies More? – Ideal for Bracelets, Survival, Belts, Wrapping Tools, Lifting, Backpacking, Hanging Bear Bags and Towing Moderately Heavy Objects. Uses Limited ONLY by Your Imagination! 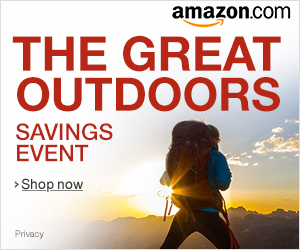 – Great for Camping, Hiking, Cycling, Boating, Gifts, Home Fixes, Cabins, or Bug-out Locations. 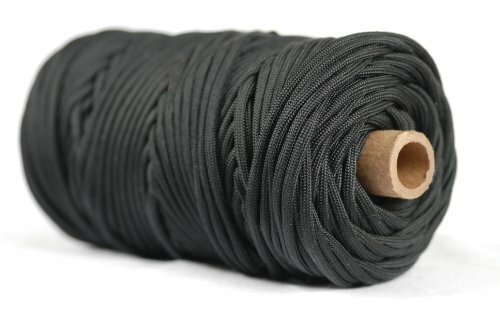 – Measures ONLY 1/32 of an Inch Bigger Around than 550lb Paracord (about the diameter of a pencil lead) With a Guaranteed Minimum 750lb Tensile Strength! 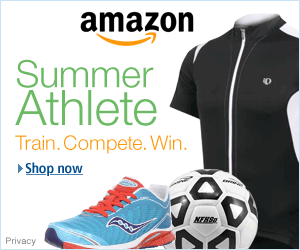 200 Pounds Stronger & Fits Great in Your EDC, Car, Tank, Backpack or Bug-Out Bag! American made quality by a company that has been supplying the US government with parachute cord for more than 100 years! Don't accept cheap foreign imports or inferior cord… you just don't have to! 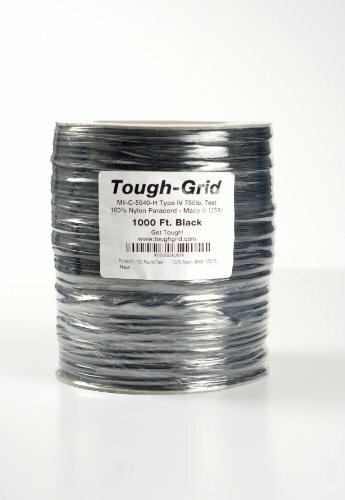 Tough-Grid Paracord Is Flexible & Tough! 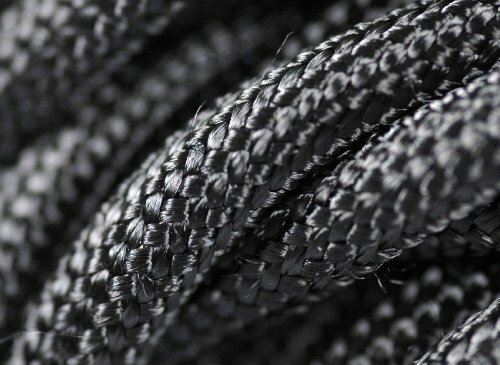 – Since it is 200 pounds stronger than 550 paracord, you'll have greater confidence when you really need it! 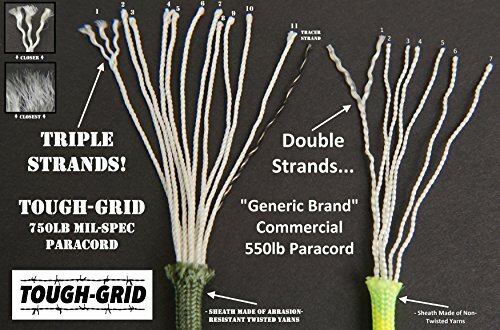 – Tough-Grid Paracord is a “”must have”” for your emergency preparedness supplies and makes a fantastic gift! 3. You Can Trust Our Paracord Is Made In The USA For Our Military & Will Not Let You Down! 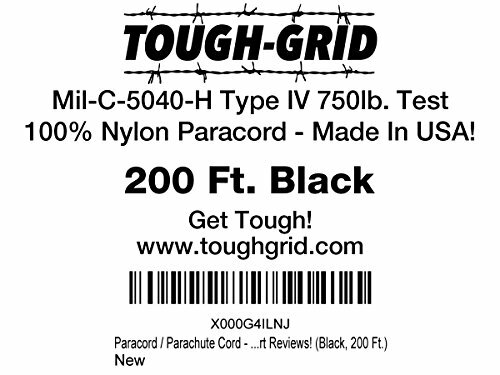 We 100% Guarantee (Replacement or Money Back) ALL Tough-Grid Parachute Cord! 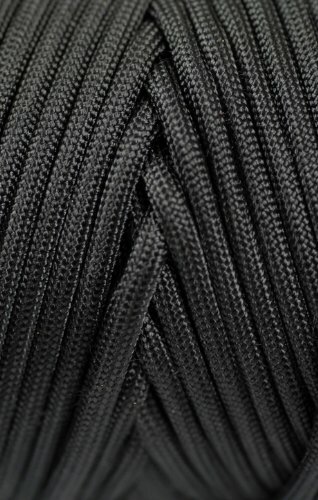 Paracord Planet Type III 7 Strand 550 Paracord – Made in the USA – Largest In Stock Selection of Parac..